I'm so proud of my son! He has his first job as a newspaper and folder deliveryboy! 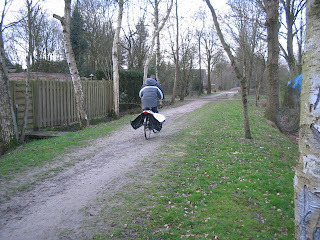 Every wednesdayafternoon he has to deliver 137 local newspapers and folders! 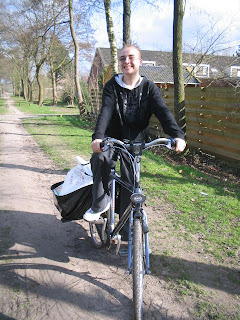 In the past he helped his older cousin Niek with his folders and about one and a half year ago his friend Manuel also got his first job as a newspaper deliveryboy and he asked Zander to help him. So he knows what is expected of him. But most important, he is really motivated to do this work! Just before his 13th birthday on march 5 (you have to be 13 for this kind of work) he heard about the vacancy for this job. Only one phonecall and he got the job! This week he can earn about 8 euro! He gets payed by the amount of different folders he has to deliver. This week there are only 4 different folders. But sometimes he has 8 or 10 folders and can he earn about 12 euro a week! Not bad for a boy of his age! Today was the first time he had to make his round. 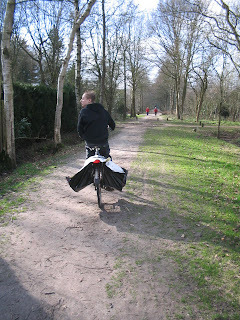 I took some pictures of him with his bike and the huge bags! The sun was shining and he thought it was warm enough to do his round without his coat. I told him to put his coat on but ofcourse he wouldn't listen to me. But within 2 minutes he had left, he returned home to get his coat. That's why there are 2 pictures of him seen from his back. congrats to zander on his new job:) you know, the path in those photos look so much like the ones at the reserve behind our house!